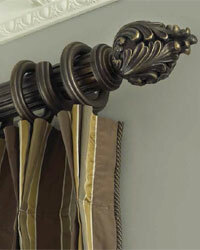 Looking to make a statment with your drapery and curtain rods? Then take a look at these choices of decorative 2 1/4" and 2 1/2" to a beefy 3 inch curtain rods that offer great choices for covering your extra long and large windows. Being so large in diameter these wooden curtain rods make the perfect choice for long windows so the scale looks appropriate for that size window. 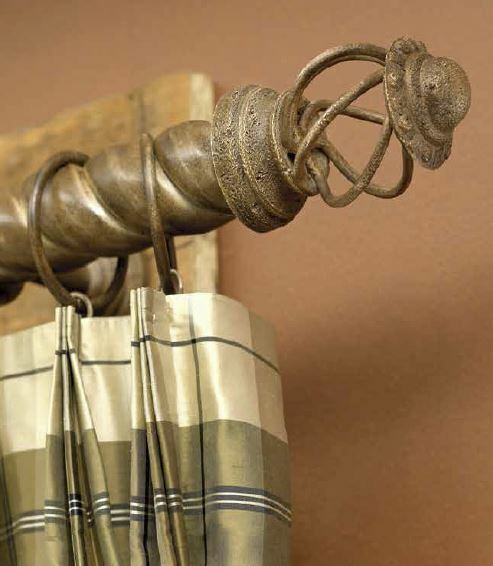 These thick, large diameter, extra large and long curtain rods offer coordinating drapery hardware including: large curtain rings in styles from plain, to decorative carved reliefs, both with eyelets for ease in hanging your drapery. Available in a great variety of colors and designs, these large curtain rods are how you can make your large and extra long draperies, curtains and window treatments have that elegant appeal. 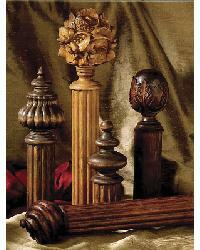 These beautifully carved, beefy 3" wood curtain rods offer decorative wood hardware to complete the look. The reeded and smooth wood poles are offered in 4, 6, 8, 12 and 16 feet lengths for covering a large variety of window sizes. Each of these large wood curtain rods, poles and drapery hardware are individually stained and may vary slightly as they may come from different trees or parts of the tree. This variation is part of the inherent beauty of stained wood. Also available are over 40 delicious designer paint colors for that custom look that is sure to set off your window treatments. There is a variety of wood brackets for flexibility in hanging your drapes as well as large wood curtain rings to accommodate them. Beautifully carved wood curtain rods and decorative wood accessories are offered in a 2 1/4 inch size in this decorative wood curtain rod offering. As each piece is individually stained they may vary slightly, with this variation being part of the inherent beauty of stained wood. 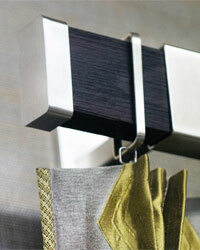 Also offered in these large curtain rods are over 40 custom finishes in a wide range of gorgeous designer colors. These 2 1/4" wood curtain rods offer all sorts of choices with 5 carved rosette styles and 9 finial styles, as well as the wood poles being offered in 2 styles, reeded and smooth. The lengths that these curtain poles are available in are 4, 6, 8, 12 and 16 foot lengths. Wood brackets in various sizes for a range of drapery return depths are offered in a traditional and a modern european design. 2 1/4" wood curtain rings with eyelets complete this offering of discount priced decorative large wood curtain rods. Chess wood curtain rods and hardware by Robert Allen is made with precision and grace just like the game, these curtain rods are named after. The Robert Allen Chess 2 1/4" wood curtain rods consists of intricately designed finials in amazing colors that will pop off your window. Choose from a coordinating mix of decorative drapery hardware that includes brackets, curtain rings and drapery pulls to complete this great look. 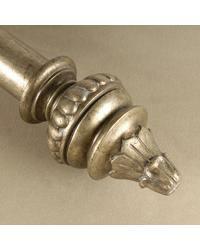 Vesta Curtain Rods City Scapes offers curtain tracks and hardware for the ultra-modern design enthusiast. Choose from unique modern designs in chrome, nickel and polished aluminum. Also included are coordinating modern picture rails for hanging your artwork. The Crystal Magic curtain rods by Vesta exudes the kind of high elegance that inspires awe. These crystal curtain rod finials represent the opulent eye catching sparkle of high leaded French crystal. All of these curtain rod finials are precision hand cut crystal and available in a variety of shapes, rich colors and six base finishes. Rectangular poles with a finial free design is offered in these contemporary styled traverse rods by Brimar. The Platforms traverse rods are offered in textured wood, faux leather and linen. 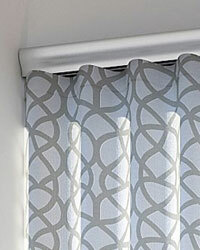 Seconday drapery rails provide options for traversing sheers and other window treatment needs. Robert Allen Toscana features a 1.5" and 2" diameter wood curtain rod and metal curtain rod with both having a smooth and roped style that was inspired by the Italian landscape and frescoes. The curtain rod hardware offers beautiful finishes and charming finials, brackets and curtain rings that create a look that will be sure to please. 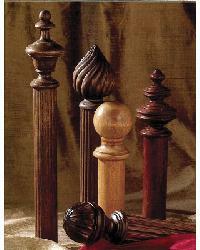 Detailed carvings inspired by famous American estates can be found in these cast resin curtain rod finials that are paired with a stately fluted wood curtain rod in luxurious finishes. The Robert Allen Traditions large 2.25" diameter fluted wood curtain rods are great for large rooms with large window treatments.